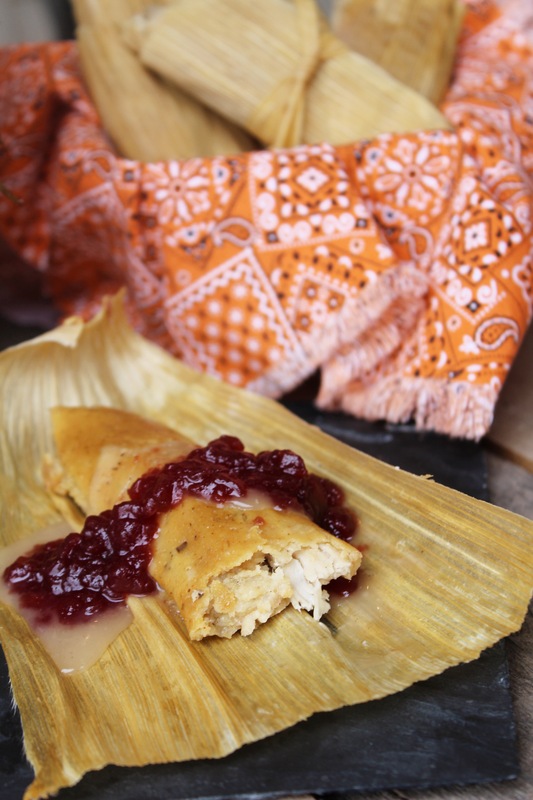 Leftover turkey and dressing are turned into simple tamales you can enjoy throughout the year. Every year at Thanksgiving, my mother gets up early and starts making our Thanksgiving meal all by herself. Once I finally started trying my hand at cooking I tried to help. But you know what? She enjoys it. I always thought I was helping her by trying to make some of her dishes for her but in the last couple of years, I’ve realized that she wants to do it all on her own. And I finally understand why she enjoys it. It’s a joy to me to cook for people. I enjoy seeing people’s reactions and giving them some comfort through food. Same goes for her. So I let her do her thing and help where I can. My main part for Thanksgiving is helping with the sides and coming up with leftover ideas. Oh yeah. Let’s hear it for leftovers. Whoop whoop. One thing my mamasita always makes the exact same way is the turkey. Every year. It’s our family tradition. Knowing I wanted to try out a couple of leftover recipes, I got her to help me make her turkey. 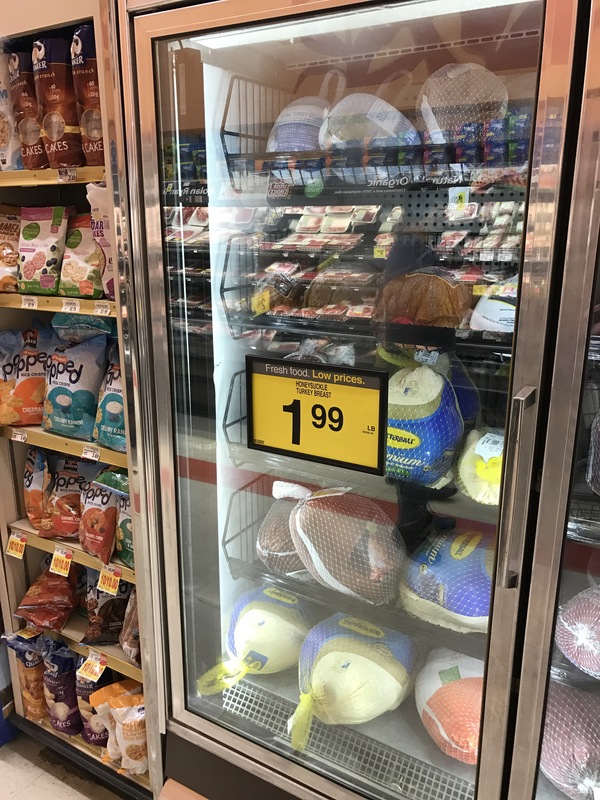 On a recent trip home to my parents house I stopped at Kroger’s to pick up a Fresh Honeysuckle White Whole Turkey. I especially like the fact that the Honeysuckle brand uses no growth hormones, no added hormones or steroids. 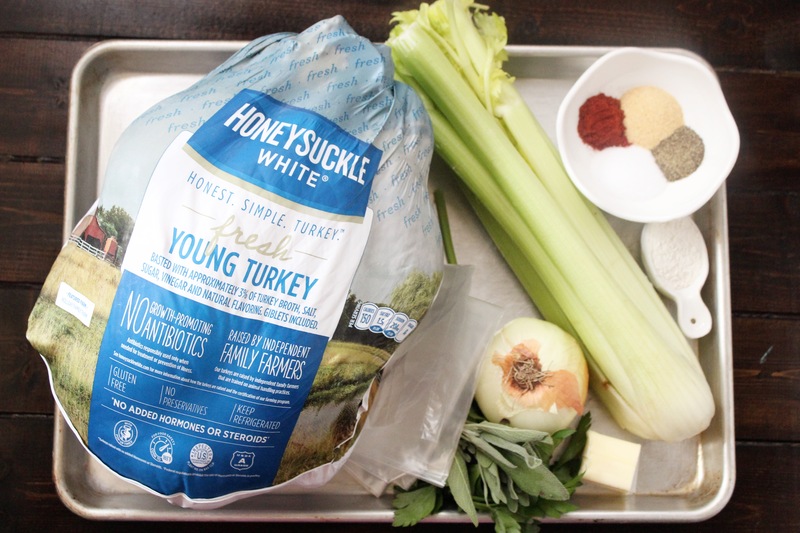 The turkeys are also raised by independent family farmers who take pride in offering a great product. That is a big plus to when we thinking of what to serve my family. Rinse turkey and remove giblets. Pat dry turkey. Brush melted butter over turkey. Mix together spices and sprinkle spices all over turkey. In oven roasting bag, sprinkle flour and toss around bag to coat. Place half of the onions and majority of celery in bag. Add remaining onions and celery into cavity of turkey. Add some parsley and sage to cavity. Place turkey in bag atop onions and celery. Tie bag and cut about six slits in bag. 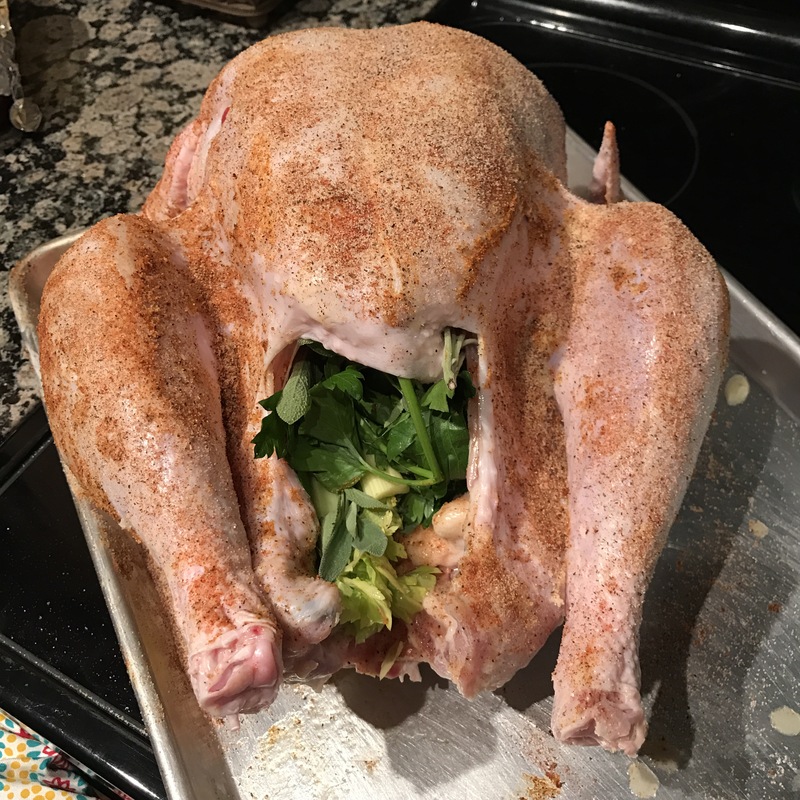 Place turkey in roasting pan. Make sure to tuck the end of the bag into the pan. Place in the oven and cook 20 mins per pound of turkey. Start checking the turkey 30 minutes before time is up. Turkey is done when breast registers 165 degrees and thigh 180 degrees on a meat thermometer. Or when the little plastic dohickey on the bird pops out. We always have leftovers. 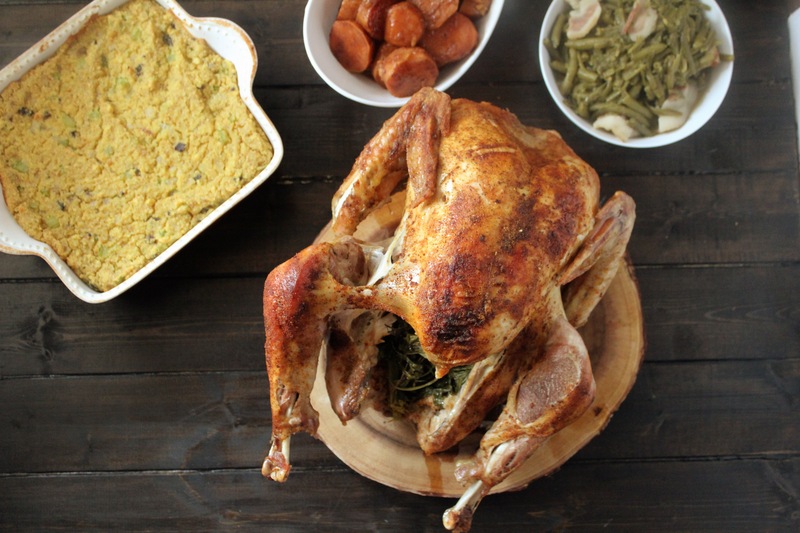 And if we don’t have enough leftovers, we make another turkey and some cornbread dressing over the weekend to ensure we have our fill. Oh yes we do. We have to make sure there is always enough for leftover treats. And when you have all that turkey and dressing, now you can make my Turkey and Dressing Tamales. I have been thinking of making these since early this year. Last year I finally tried my hand at making tamales and now I’m hooked. It may also be because my family loves my tamales! Now I have to try different flavors. I took some of these into the office for my taste testers to try and they loved them. One coworker said she thought I was crazy when I told her what I was making but I changed her mind. I hope you give them a try. I know my parents are going to flip for them and I’ll have to make more with our leftovers this year. Now to make things a little easier on myself, I used a premade masa that my store sells in the meat section. It cuts down a step and when you are making tamales, that helps. 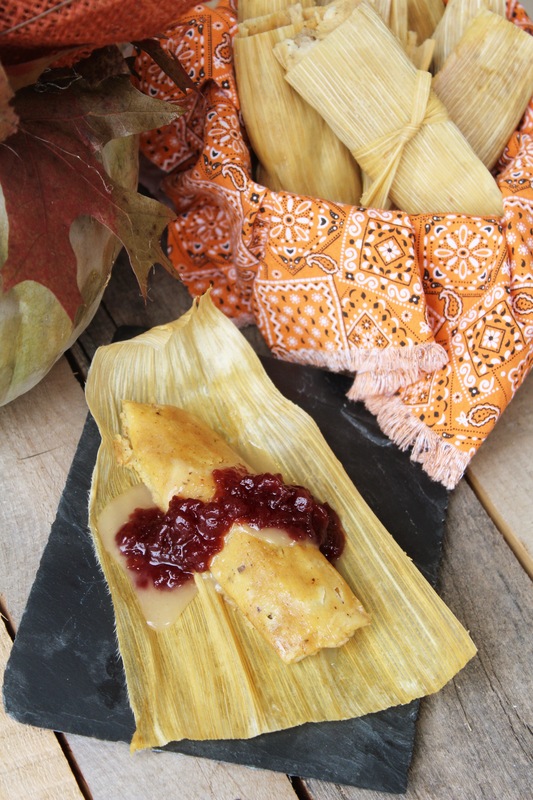 Thanksgiving leftovers of turkey and dressing make the perfect tamales to have year round. Place corn husks in the sink and fill with hot water. Soak for at least 30 minutes. In a large mixing bowl, add masa, melted lard and spices. Gradually add warm broth to the mixture. Mix with your hands to incorporate all the spices into the masa. If you think you are done, mix some more. You don't want any lumps. You want your masa to have the same texture as creamy peanut butter. Add more broth as needed to get to peanut butter texture consistency. To prepare filling, shred turkey and cut into bit size pieces. Add leftover turkey to large sauté pan and heat. Add heated turkey to large mixing bowl. Add in gravy, spices and broth until you get a wet turkey mixture. You don't want it to wet but you do want it to be flavorful and moist. Heat up leftover cornbread dressing. Using a tamale spreader, start spreading masa on the shucks. Once masa is on the shuck, take a bit of turkey and place down the middle. Add some cornbread dressing on top of the turkey. Take one side of corn husk and roll over the filling then roll again to form the tamale.Take bottom and fold under to secure in place. Fill a steamer pot with water to just below the steamer insert. Place the steamer insert in the pot. Place tamales standing up with open end facing up in the pot. Take a dish towel and soak it in water. Place the dish towel over the tamales and around the tamales to keep them from touching the pot. Turn heat to high and bring water to a boil. 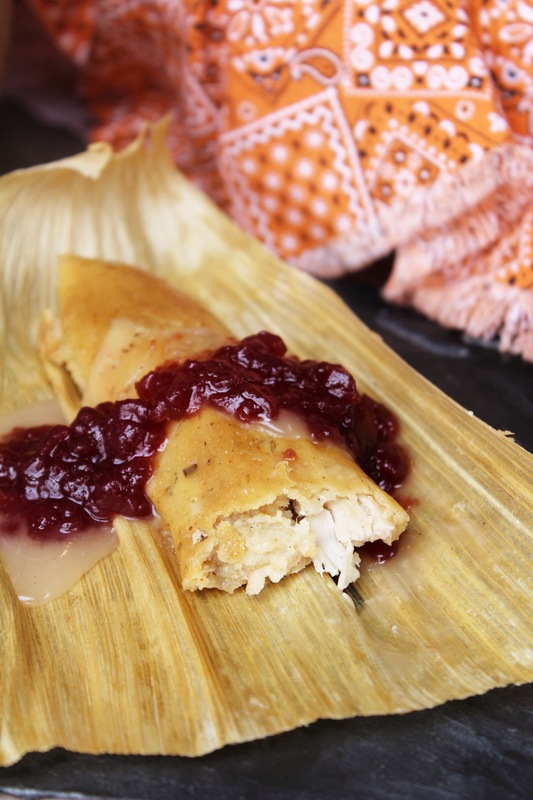 Once water starts to boil, reduce heat to simmer, cover and steam tamales for 1 1/2 hours. Top with turkey gravy and cranberry sauce. *Note: Masa makes about 5 dozen tamales. This is worth making a turkey breast or another turkey to have turkey and dressing tamales throughout the year. Amount depends on how much leftovers you have.